London is no stranger to a themed bar – just think of the number of speakeasies that seem to pop up each year. While this can become tedious, I genuinely believe there’s at least one gem out there, somewhere. 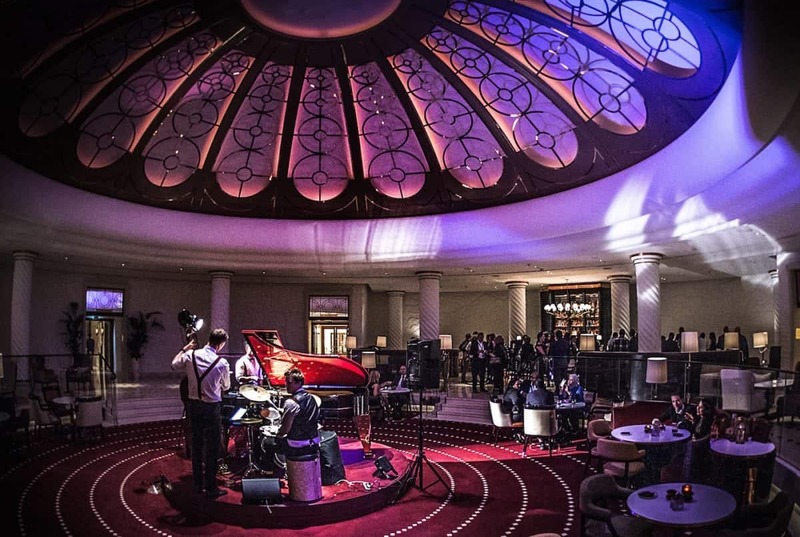 The Rotunda Bar at London’s Trinity Square Four Seasons Hotel, is dedicated to the roaring twenties. 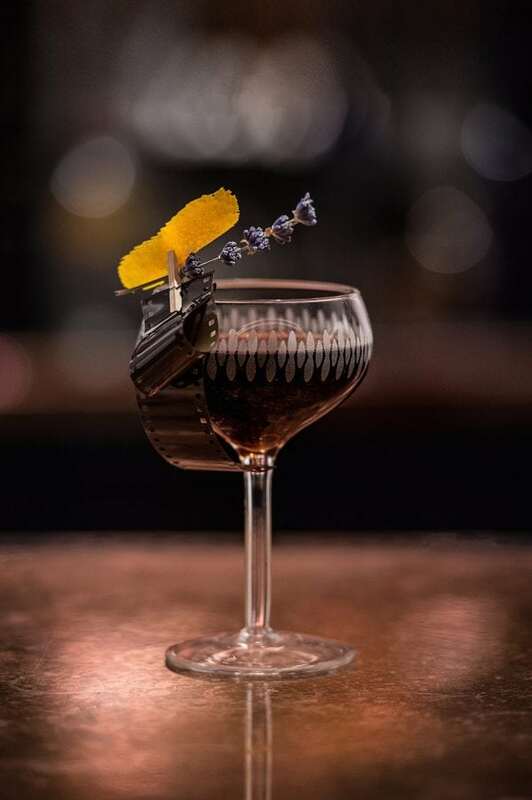 Inspired by the Bright Young Things (the group of bohemian aristocrats and socialites, known for being at the centre of many a party), Head Bartender Michal Maziarz has designed a menu based around specific recipes and ingredients popular at the time. The Beaux-Arts-style building also pays homage to the glitzy, Great Gatsby-esque era of flappers and Dixieland jazz, with its marble floors and central Grand Piano played during afternoon tea. A live band also plays on Thursday, Friday and Saturday evenings. We settle in at our table, underneath a colossal chandelier, and pick up the ‘Flappers Dictionary Cocktails’ menu. We’re pleased to discover Michal has taken the concept right through to the names of the cocktails. Each title is a historical wink at London’s 1920s slang. While some visitors may find this pompous, I find it endearing and happily let our waiter suggest a couple of drinks of his choice. The Blushing Violet (£12) (slang for ‘publicity hound’) combines violet (surprise! ), white grapefruit, elderflower and sweet wine, served in a slightly oversized champagne flute. It’s an electric blue but tastes conversely fresh, with a distinct note of the sweetness of grapefruit. Thanks to the sweet wine, however, we’re spared from its classic bitterness. The Petting Pantry (£16) -slang for ‘cinema’- on the other hand, is a mixture of Plantation rum, dry sherry, spiced wine and citrus oils. It smells surprisingly like an Old Fashioned, though it’s smoky but fresh with a zing of citrus. If this is what the Rotunda Bar has to offer, it’s practically impossible to resist a second (and ultimately a third) round. This time, we opt for Corn Shredder (£16) and Big Timer (£18). Both are short drinks, but that’s where the similarities end. The Corn Shredder (slang for a ‘young man who steps of women’s feet when dancing’) features Tanqueray TEN gin, agave, toasted corn and pink grapefruit. Our waiter explains that the corn used during the process is syphoned off at the end, and we should be left with a clean liquid. It is, indeed, a clear, crisp cocktail, which starts off sweet, but finishes on savoury notes. The Big Timer (slang for a ‘romantic man’), on the other hand, teams Remy Martin V.S.O.P cognac, with orange, lovage and lychee. Again, the knowledgeable waiter explains the process: the two lychees served with the cocktail are both freeze dried, one with positive and one with negative temperatures. This means that one is light and sweet, while the other is hard, like a boiled sweet. While the cocktail is difficult to drink with two lychees balancing on top, the final product is pleasingly sweet. Finally, Eddisoned (£12) – the hombre long drink of lemongrass, tonic, cranberry and ketel one vodka, with a name that’s slang for ‘being asked many questions’. From the first sip, both the child and adult within me are jumping for joy: the drink tastes exactly like lemon sherbet. Unlike the Blushing Violet, I couldn’t drink this all night, but it makes me ecstatic for its duration. Overall, the cocktail list is not extensive, but everything offered is done well, with some quirkiness. What’s surprising though; the atmosphere of the Rotunda Bar is completely immersive. As we leave, I catch myself half expecting to be met by horse-drawn carriages and top hats in the London night. Rotunda Bar at Four Seasons Hotel London can be found at 10 Trinity Square, London, EC3N 4AJ. Next PostIs this the best coffee in the world? A freelance copywriter working on marketing accounts across a number of industries by day, Maggie is a keen foodie. Thanks to her Czech origin, she also has a soft spot for London’s craft beer scene.